Recently, scientists from China and the UK reported two Middle-Late Triassic entomofaunas, providing not only the earliest records of several modern insect elements, but also new insights into the early evolution of freshwater ecosystems. This study confirms that holometabolous and aquatic insects experienced extraordinary diversification about 237 million years ago. The research was published in Science Advances on September 5, 2018. The true Trichoptera was thought to have diverged from Amphiesmenoptera in the earliest Jurassic. The Holometabola are the most diverse insects in the Tongchuan and Karamay entomofaunas and are represented by diverse beetles and scorpionflies. Holometabola were thought to have become dominant in the global entomofauna starting in the mid-Mesozoic. 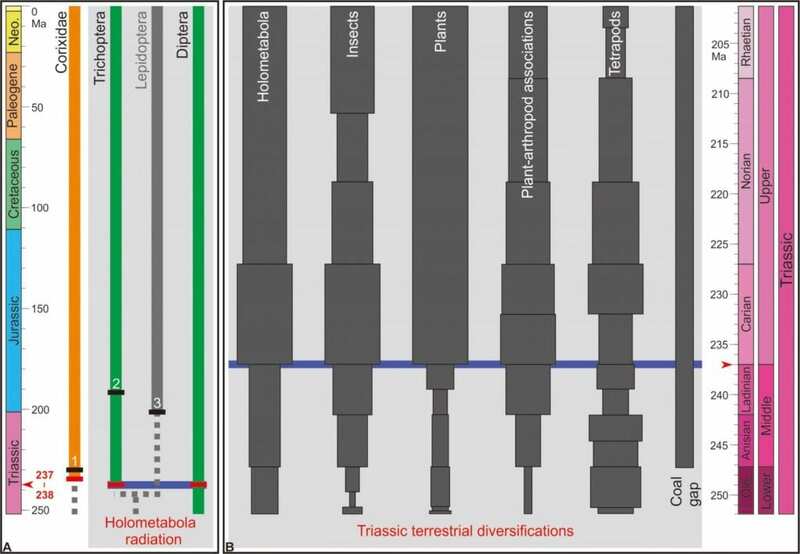 Thus, its high diversity and abundance in Tongchuan and Karamay are relatively unexpected, revealing a radiation of Holometabola during the Middle Triassic. In addition, water boatmen are abundant in the Karamay entomofauna, making them the earliest record of aquatic bugs. These aquatic insects developed new herbivore and carnivore guilds that persist to the present. The diversification of aquatic insects was thought to be part of the "Mesozoic Lacustrine Revolution," which dates to the Middle Mesozoic. The current study suggests, however, that this diversification had already begun by the Middle Triassic, thus providing new insights into the early evolution of freshwater ecosystems. This research was supported by the HKU Seed Funding Program for Basic Research, the National Natural Science Foundation of China, and the Chinese Academy of Sciences.